This revision of Dummit and Foote's widely acclaimed introduction to abstract algebra helps students experience the power and beauty that develops from the rich interplay between different areas of mathematics. The book carefully develops the theory of different algebraic structures, beginning from basic definitions to some in-depth results, using numerous examples and exercises to aid the student's understanding. With this approach, students gain an appreciation for how mathematical structures and their interplay lead to powerful results and insights in a number of different settings. The text is designed for a full-year introduction to abstract algebra at the advanced undergraduate or graduate level, but contains substantially more material than would normally be covered in one year. Portions of the book may also be used for various one-semester topics courses in advanced algebra, each of which would provide a solid background for a follow-up course delving more deeply into one of many possible areas: algebraic number theory, algebraic topology, algebraic geometry, representation theory, Lie groups, etc. 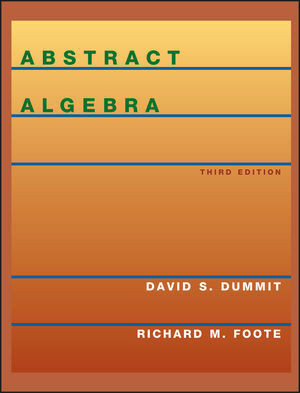 David S. Dummit and Richard M. Foote are the authors of Abstract Algebra, 3rd Edition, published by Wiley. Appendix I: Cartesian Products and Zorn's Lemma. Accessible to undergraduates yet its scope and depth also make it ideal for courses at the graduate level. Over 1950 exercises, many with multiple parts, ranging in scope from routine to fairly sophisticated, and ranging in purpose from basic application of text material to exploration of important theoretical or computational techniques. The structure of the book permits instructors and students to pursue certain areas from their beginnings to an in-depth treatment, or to survey a wider range of areas, seeing how various themes recur and how different structures are related. The emphasis throughout is to motivate the introduction and development of important algebraic concepts using as many examples as possible. The wealth of examples helps to ground the theory, explain its application, and help develop the student's intuition.